A group of Texas A&M student volunteers are spending their spring break far away from the maddening crowds and instead have chosen to cover themselves in muck. They’ve slipped on the waders and are trudging through the marshes at the Trinity River National Wildlife Refuge for a learning retreat that is helping clean up Liberty Pond. Part of this project includes removing the aggressive Water Hyacinths from one the ponds. This could only be accomplished by wading in waist-deep water and kayaking to pick up the plants by hand one at a time. If these particular plants aren’t trimmed back, they can quickly overwhelm this delicate eco-system. One of the students from the San Antonio area told a local newspaper about why she is doing this while a lot of her classmates are off sunning themselves. “This is what I love. I could do this every day. Even though I am exhausted, it is not like work. It is fun.” That includes the bout of poison ivy she got while on the clean up grew! This kind of story certainly puts your own spring cleaning project in perspective. You’re only dealing with cleaning up your home or yards; you’re not going into waist deep pond water! You’ll also be working indoors which means access to cool drinks and fun tunes. Plus, you’re entitled to take as many breaks as you want. One advantage that the Liberty Pond cleanup effort has it there is an entire team doing the work. That will certainly make it go faster. Fortunately, you’ve got the exact same opportunity to have your own team. Call it team Junk King San Antonio. Junk King is the San Antonio based business of professional junk haulers who have multiple crews and trucks standing by to be dispatched for any junk removal chores. 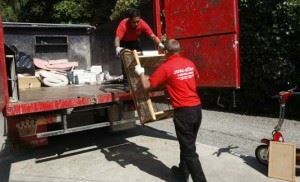 How Junk King can work with you is by helping get rid of the clutter from your home before you clean. This is all that junk you’ve been staring at for months and years wondering when it’s going to disappear. Instead of waiting for magic, just call Junk King. They will make it disappear for sure! Another approach would be to call Junk King after your spring cleaning. That’s because you might discover a lot more junk you want to throw out as you clean through closets, under beds and in garages. All you need to do is start a pile for Junk King. Even if that pile grows as big as your own home, Junk King San Antonio won’t freak out. Whatever you throw at the crews, chances are they’ve seen worse! As soon as that clutter is gone from your home, then you’ll be able to do a deep cleaning like never before. It’s a perfect way to kick off the spring! This entry was posted in Junk King San Antonio, Large Trash Pickup, San Antonio Green Junk Removal, San Antonio Junk Pickup, San Antonio Junk Removal, TX Junk Removal and tagged san antonio hauling, San Antonio Junk Removal, texas junk removal on March 31, 2012 by Mike Hasselbalch. Last updated August 2, 2017 .